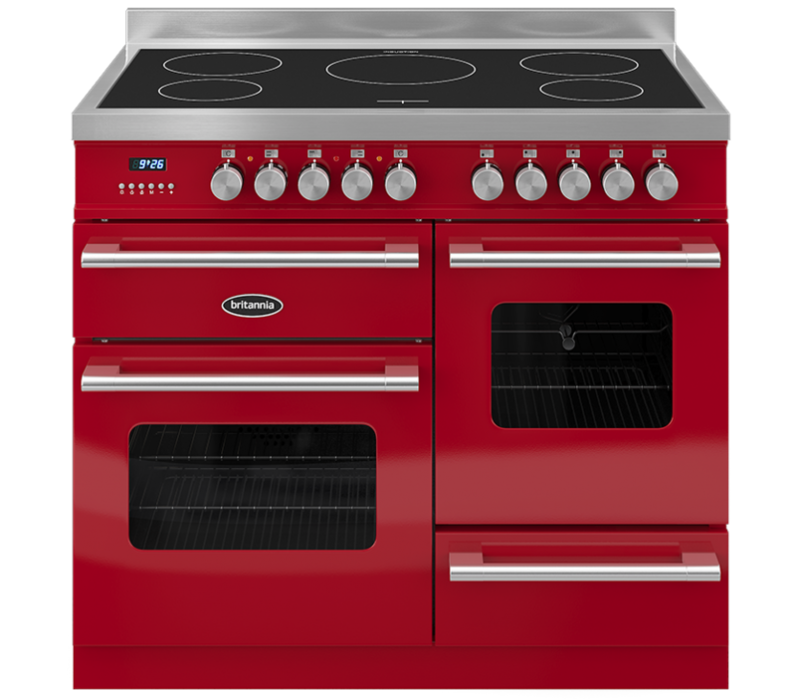 The Britannia Delphi 100cm XG RC10XGIDERED Electric Range Cooker boasts two ovens with 52 and 28 litres of cooking capacity, this 100cm wide cooker allows you to prepare a variety of dishes simultaneously. The main oven cavity features nine cooking functions, while second cavity includes a rotisserie so you can spit roast succulent chicken. Each oven also comes with an interior light and an integrated grill. The RC10XGIDERED is fully programmable and features a digital display with simple controls. The electronic clock lets you time your food to perfection, while the quick start mode lets you pre-heat the oven in no time. There's also a handy storage drawer so you can keep your baking trays and roasting tins within easy reach. The single plate hob has five induction cooking zones so there's plenty of room for all your pots and pans. Each zone has nine power levels allowing you to keep precise control over the temperature. Its smooth surface is easy to clean and prevents grease from sticking – a quick wipe with a damp cloth will get rid of any dirt.